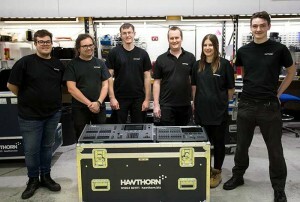 UK – Hawthorn, an award-winning UK based creative technical event production specialist, has purchased multiple new Zero 88 consoles, both FLX and FLX S series and join a growing number of top UK rental companies investing in the power and simplicity of the FLX ranges, which are manufactured exclusively in the UK by Eaton’s Zero 88. Hawthorn has a long history with Zero 88 legacy console products and continue to offer different types of Zero 88 dimmers, however they had switched to another console brand for a while to find a small to medium event console solution. The new batch of FLXs is replacing some of those older consoles which have served well for many years but are now not ideal for controlling the proliferation of LED based fixtures on the market. FLX ‘hot’ features for Hawthorn include the intuitive and uncomplicated way that the console guides the user through set-up which is perfect for users with little knowledge about patching. “FLX is perfect for this scenario with its colour picker and the quick and easy set-up,” declares Adrian. The latest batch of Hawthorn FLXs were purchased for some of their venues at the 2018 Edinburgh Fringe Festival – specifically Assembly and Summerhall – which was a great success. They are in regular rental stock and in active service on all types of applications, from educational and amateur dramatic shows to corporates and industrials. More recently, they have been out with an amateur dramatic society production in Sheffield, lighting a philharmonic orchestra for another client and several conferences, all illustrating the consoles' versatility. With over 100 Zero 88 consoles in action at various venues over the course of the vibrant three-and-a-half-week theatre and performance art festival, Zero 88 product manager Jon Hole and his team were right there on the front lines, offering comprehensive on site training and support. In picture: Sam Burns, Gavin Kuzniar, Chris Ruddle, Matt Edgington, Becky Digby and John Ray from Hawthorn’s lighting department.